Religion and politics are never far from the headlines, but their relationship remains complex and often confusing. This book offers an engaging, accessible, and balanced treatment of religion in American politics. It explores the historical, cultural, and legal contexts that motivate religious political engagement and assesses the pragmatic and strategic political realities that religious organizations and people face. Incorporating the best and most current scholarship, the authors examine the evolving politics of Roman Catholics; evangelical and mainline Protestants; African-American and Latino traditions; Jews, Muslims, and other religious minorities; recent immigrants and religious "nones"; and other conventional and not-so-conventional American religious movements. • Covers the 2016 election and assesses the role of religion from Obama to Trump. • Expands substantially on religion’s relationship to gender and sexuality, race, ethnicity, and class, and features the role of social media in religious mobilization. • Adds discussion questions at the end of every chapter, to help students gain deeper understanding of the subject. • Adds a new concluding chapter on the normative issues raised by religious political engagement, to stimulate lively discussions. The new edition of this essential text on religion and American politics includes terrific features to help students engage with the material. I am especially impressed with expanded coverage of religion and intersectionality, as well as of religion in the Trump era. Religion and Politics in America continues to challenge students to understand how religion and culture interact and influence each other in American politics, including the impact of this dynamic on public policy. This insightful new edition introduces new information on race, gender, and sexual orientation in a manner that highlights change and stability across the political, legal, and cultural arenas. This thoughtful new edition closely tracks the current salience of religion to the political system, while carefully placing these developments in historical and theoretical context. It will promote discussion of the key issues in the field in both introductory and upper level courses—a real achievement. Carefully re-organized and updated, the new edition builds on the impressive 2nd edition. Fresh insights abound in this accessible text. Religion and Politics in America is an invaluable primer on this increasing important topic. Well-written, well-researched and up-to-date, it combines a broad vision of the role of faith in American public life with sensitivity to the nuances of religious communities. This outstanding book is must reading for anyone interested in religion and politics in the United States. The authors provide a current, comprehensive, and accessible examination of an exceedingly important subject. 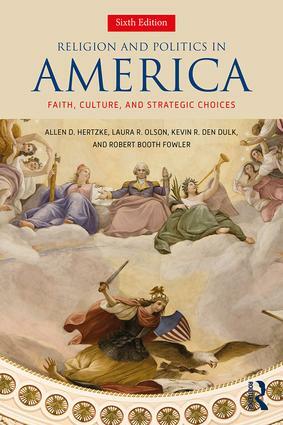 A thoughtful, well-balanced work… Few books provide as comprehensive a survey of religion and politics in America as this one… A valuable book for students and scholars of religion and politics in America. The authors do the field of religion and politics a great service with this introductory yet sophisticated text. An outstanding synthesis of historical, sociological, and cultural perspectives on religious activism and church-state issues in the U.S. This book delivers handsomely on its title… The authors provide an insightful guide to both contemporary religion and contemporary politics in America. It is essential reading for those who would understand the often confusing cultural churnings that are transforming our public life. Allen D. Hertzke is David Ross Boyd Professor of Political Science at the University of Oklahoma. He is author or editor of several books on religion and politics, most recently Religious Freedom in America and Christianity and Freedom, vols. I and II. Laura R. Olson is Centennial Professor in the Department of Political Science at Clemson University and Editor-in-Chief of the Journal for the Scientific Study of Religion. Kevin R. den Dulk is the Paul B. Henry Chair in Political Science and Director of the Henry Institute at Calvin College. He is the coauthor of The Disappearing God Gap? Religion in the 2008 Election and Pews, Prayers, and Participation: Religion and Civic Responsibility. Robert Booth Fowler is Professor Emeritus of Political Science at the University of Wisconsin-Madison. His published books include Enduring Liberalism: American Political Thought since the 1960s, The Dance with Community: The Contemporary Debate in American Political Thought, and Unconventional Partners: Religion and American Liberal Culture.